We have been very busy since coming back to school. 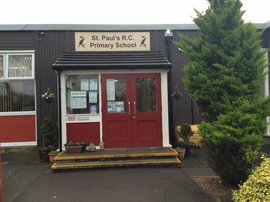 As always at St Paul's we have had a very active start to the year. So far we have competed in the following Level 2 competitions against other schools: tag rugby, cross country, girl's football and Sportshall athletics. Every child in Year 4,5,and 6 has represented our school in at least one competition. We have had some Level 1 competitions at lunchtime and in PE lessons. Our children are very active making sure they are doing 60 minutes a day of activity with 30 minutes in school time. Year 2 had a great afternoon at the Multi-Sports festival trying lots of different activities. We were also featured in our local newspaper promoting PE and school sports.